INTRODUCING guide to the father of existentialism and one of 20th century philosophy's most famous characters. Jean-Paul Sartre was once described as being, next to Charles de Gaulle, the most famous Frenchman of the 20th century. Between the ending of the Second World War in 1945 and his death in 1980, Sartre was certainly the most famous French writer, as well as one of the best-known living philosophers. Introducing Sartre explains the basic ideas inspiring his world view, and pays particular attention to his idea of freedom. It also places his thinking on literature in the context of the 20th century debate on its nature and function. It examines his ideas on Marxism, his enthusiasm for the student rebellion of 1968, and his support for movements of national liberation in the Third World. The book also provides a succinct account of his life, and especially of the impact which his unusual childhood had on his attitude towards French society. Philip Thody was Professor of French Literature at the University of Leeds until 1993. He died in 1999. Better suited for young readers.....like those that are just getting interested in philosophy. The entire book series seem to be geared towards "beginner" readers on the given book topic. This is more suited for someone that knows nothing or very little about Sartre. Excellent synopsis of a very obtuse writer. The real triumph of this work is that you feel compelled to read Sartre again. At least try!! 5.0 out of 5 starsExcellent introduction to Satre! 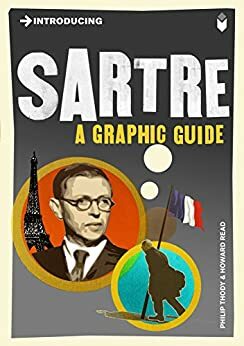 If you are looking for a good, quick introduction to Sartre's Philosophy, I would not start with _Introducing Sartre_ from Totem Books, but with _Sartre For Beginners_ from Writers and Readers Publishing. _Introducing Sartre_ focuses more on Biographical information, and brief Literary analysis of Sartre's novels and plays, than on his Philosophical works and their meaning. The illustrations are frequently just "fluffy" caricaturization instead of helping us understand characterization. Why would I want to struggle with trying to determine which figure is supposed to be Aron, Nizan or Sartre? While as a whole, the book was a somewhat interesting read, the weakness of its philosophical examination allowed me to only rate it 3-Stars. _Introducing Sartre_ is an interesting concept: use the format of a graphic novel to expound on the ideas of one of the 20th century's greatest minds. Unfortunately, the concept falls flat in execution. I won't go into detail about the relative merits (or not) of the artwork. The book, however, left much to be desired. It is essentially a biography of Jean - Jacques Sartre, with only cursory attention paid to existentialism as a philosophy. Admittedly the two are related, but I had really hoped for a closer and deeper examiniation of his ideas - instead I got medicore biography. If a summary of Sartre's life is of interest, this would be a great place to begin. If, however, you are looking for information about his ideas, go elsewhere.